Five years ago I spent some time at a stone cottage in Brittany, France. One of my English flatmates and his parents spent vacations there and we arranged that I would take a train on Easter morning from Paris to Paimpol to meet up with his small family to have a holiday of my own. Every morning, his dad went into town and returned with fresh baguettes. Every evening, his mom gave me a hot water bottle to keep my bed warm through the night. Joe and I hiked the serene Brittany coast and visited the Paimpol market. 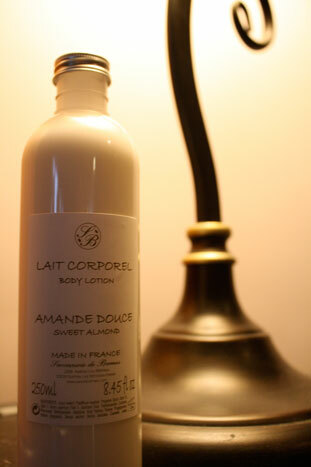 It was there that I bought a slender bottle of lotion that smelled deliciously of apricot. I smoothed it on my legs, my elbows, my hands and wrists every morning. I lay in the backyard at midnight, next to the garden, with an achingly lucid sky overhead, the fruity scent sharp and tangy against the smell of dewy grass, dusty blanket, dark roses. I made it last as long as possible, well into my summer back in the States and the fall semester of my senior year back at college. When I finally had to toss the empty bottle, I tried to find the company online but didn’t have much luck. A few weeks ago, my mom and sisters spent a few hours in Galena, Illinois, marveling at the sudden warmth in the October air. Conversation was comfortable and easy and my glass of zinfandel was satisfyingly sweet. I scanned the shelves of a Provencal shop and there they were—familiar slender ivory bottles. With one innocent sniff of the apricot, a blur of snapshots assaulted me, along with a peculiar feeling of who I was five years ago. The memories and specific emotions were so strong. And so good. But unsettling, because five years seems like a lifetime in some ways, and I don’t want to live in that life every time I smooth the fragrance onto my skin. I purchased another scent, sweet almond; it’s a sweet blank slate, but not for long. As I use it through the winter, I’m sure it will become significant; it will become a redolence I may stumble upon in five years, an encounter that bowls me over with associations of my lovely boy not yet one year old, my complicated anxieties as a new mother, my fumbled attempts at embracing love and mystery. I think is great material for a short story or essay. Have you ever thought about fleshing it out and submitting it somewhere?